Painted in 1565 in a style that’s now known as Flemish Renaissance, “Hunting in the Snow” shows villagers enduring a hard winter in Belgium. The hunters seek food for their families, braving the elements that have gripped their small village. The original is the work of oil painter Peter Bruegel (1525-1569), who was considered one of the greatest Flemish painters of his time. He painted a wide range of subjects, from mythology to social satire, but he found nature to be his greatest inspiration. 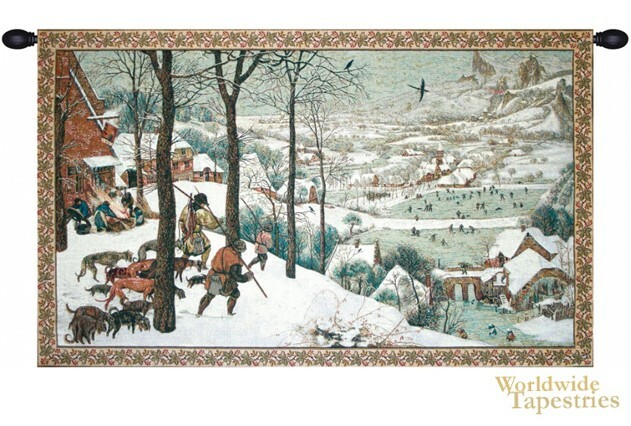 Integrating daily 16th century life with an amazing scenic, Bruegel’s “Hunting in the Snow” is a masterpiece in this style. The original is currently on display at the Kunsthistorisches Museum in Vienna. This tapestry is lined on the back and has a tunnel for easy hanging. Note: tapestry rod and tassels, where pictured, are purchased separately.